Chart based on 86 repairs. 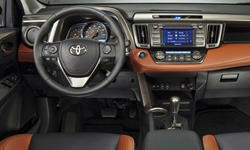 See TSBs and recalls for the 2013 Toyota RAV4. US $160 AC was very weak. Mechanic tested the system for holes and recharged it. Brakes were making a squealing noise. Mechanic checked pads & rotors and determined there was still plenty of wear left, so no repair/replacement done. 49000 mi Recurring problem with AC system leakage (3rd visit in 3 months). Mechanic unable to identify the source without taking dash apart, so we chose to wait until next season for repairs. 66000 mi Rough, dry starts. Oil control valve and cam gear replaced per TSB. Replacement gear also defective, replaced again along with camshaft. Dry starts continue. 4000 mi Had to take passenger door completely apart and readjust window regulator due to poor assembly then foamed. Rattle in dash due to "Excessive Clearance" in radio garnish. Applied foam to contact points and rattles ceased. 10768 mi Car suddenly would not start. Battery was about 2 years old. Key fob battery was new. Could not jump start. Towed to dealer. Dealer first suggested that alarm was showing a short causing the problem. Wanted 2 hours PLUS diagnostic charge to remove alarm (about $450) just to test this out. The selling dealer installed alarm was deactivated when the car was sold, so it wasn't even a problem. Problem persisted; case opened with TIS. Eventually, it was determined that the steering computer 45020-06130 was the fault. Replaced computer and the car started, however, the key fob would not communicate with the car so the smart key computer 89990-0R021 was replaced. Car is fully operational. 6300 mi Rattle in dash. No parts replaced. Dash was just put more securely on. No more rattles. 23000 mi Molding under roof rails would pop out under a high powered blower (car wash). Molding replaced. 23700 mi The panel for the sunroof and interior light was separating from the ceiling. Replaced the part and it did not fix (made it worse). Will have it in again this month to re-evaluate with the manager and a Toyota rep. They snapped the panel back in successfully, but forgot to attach the microphone for bluetooth. 25000 mi They forgot to put in the microphone for the bluetooth when they replaced my sunroof/light panel. It was reattached and working fine. US $130 Bluetooth function had failed preventing Hands Free Calling, listening to music from my iPhone, etc. 22000 mi Car did not start. Had Toyota care send tow truck to jump it to get it started and went to Toyota. They replaced the battery after checking the system. US $415 Loose screw damaged left front caliper and pads. The problem created excessive vibration and noise. Both front calipers and pads were replaced. 36000 mi The car started having trouble shifting into 5th gear. It would hand, clunk and rev before settling in. Then it had trouble going into reverse. Told that transmission was going out. Decided to trade for a new car. 32300 mi Lower plastic door trim replaced. Trim pulled away from door. Passenger side. 33000 mi Roof rack trim popped out during car wash visit. Trim replaced. Trim popped off again. Took back to dealer. They taped it back on. No repairs since. 26040 mi Blew driver side door speaker. 40300 mi Noise problem with the drivetrain that was acknowledged but never fixed by Toyota. C $280 Wiring chewed by rodents while parked at airport . Some replacement, some repair after vehicle towed. 9900 mi Rear power liftgate rattling. 11000 mi Check engine light, AWD warning and Traction control lights all were on. 14000 mi Roof channel trim came loose while driving. Not held in very well, as very easy to remove by hand. US $120 Drivers seat squeaking during any movement or driver. 21000 mi Fabric coming loose from armrest area of both front door panels. Toyota refused to repair this under CPO warranty. Quoted a cost of $1500, to replace both so I am not having it repaired. US $1000 Replaced windshield that shattered due to a manufacturing defect. US $46 Headlight was intermittently not coming on, eventually failed and was replaced. US $151 Rear window wiper motor failed and was replaced. US $730 Brake pads replaced, rotors and drum. Note - brakes were replaced within the last 18 months. They lasted ~60,000 miles the first go round. 41500 mi The car was vibrating between 30-45 mph with little throttle. Vibration at low speeds. Dealer replaced torque converter. 15000 mi Fabric liner on right front door inner panel peeling off / bubbling. 33000 mi The dealer determined that the torque converter was making a humming noise and it was replaced. The noise decreased but returned shortly after. 50000 mi replaced torque for second time and problem still exists. now dealer is suggesting to replace transmission. replaced torque for second time and problem still exists. now dealer is suggesting to replace transmission. 70000 mi The dealership could never solve the transmission/torque converter noise, finally stating that "we were probably fixing something that was normal." I simply had enough of that RAV. Hello, Subaru. 21000 mi Bluetooth/navigation. Nothing was done. Dealer kept dodging the problem. US $650 The torque converter clutch started slippiing. Drive train was outside of 60000 mi new car warranty but Toyota paid for parts $750 and I paid for labor $650. November 2017 Toyota extended the transmission warranty to 150,000 mi and refunded me $650. The repair cost me nothing. Thanks Toyota! 3200 mi Door trim became detached. Windshield trim came loose. 3500 mi Rubber extrusion on LH cowl at btm of windshield was loose. (A problem reported on RAV4 forum). Dealer replaced entire cowl - a $400+ part. 35220 mi Drivers seat belt replaced under warranty. 8680 mi Battery too low to start car; boost given under Toyota roadside assistance. This was after 5 days not used. 8780 mi Asked that previously reported problem with low battery be checked. I was told there is no problem - we are not driving enough. Solution is for me to install a trickle charger. C $55 Car has had two boost starts in past two years. Dealer says no problem with systems. Issue is driving pattern; trips are too short. I bought and installed a trickle charger. 14140 mi Replace leaking left rear shock. C $400 Premature pad wear, replace rotors. Front brakes. C $526 Drivers front door would not LOCK / UNLOCK with remote or electronically at all. Door Actuator needed to be replaced. C $600 Passenger front door would not LOCK / UNLOCK with remote or electronically at all. Both REAR doors would not LOCK / UNLOCK with remote or electronically at all. 3 door lock actuators replaced adding to the previus repar of the drivers front door lock actuators being replaced. In TOTAL, so far, 4 Door Actuator needed to be replaced. This is CLEARLY a DEFECT. I am pursuing legal action against Toyota. 33480 mi Now the hatch door has problems!! The LOCK / UNLOCK would not work for the trunk.....It works when it wants to. I lubricated the door lock actuator but the problem always comes back. EVERY DOOR LOCK HAS BEEN AN ISSUE ON THIS CAR... I should have bought a Honda! C $515 Water Pump Leaking just after 5 years and not even 70K KM. Not a good car!! Water pump needed to be replaced. 10000 mi Roof rubber strip under rack came loose on highway, started banging on side of car. Small strip of two sided tape holds rubber within trough. Dealer replaced, indicated they see this often and usually caused by car wash water pressure. 1000 mi Right front speaker was not functioning. 2000 mi Ticking noise in steering when turning the wheel left of center. 9700 mi The seatbelt adjuster had a rattle. Dealer tried to fix, but rattle continued. The part was then replaced under warranty. See our lemon odds and nada odds page to see vehicles with no repairs or vehicles with more than three repairs. 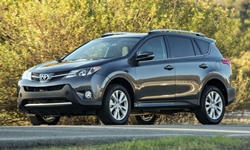 To see how frequently 2013 Toyota RAV4 problems occur, check out our car reliability stats.